I have been knitting up a storm lately. I realized I had about 9 knitting projects on the go so I have been striving to finish at least some of them. The first project to cross off my list was this charming cabled sweater. It doesn't really look anything like the pattern, which was accidental rather than planned, but I am very happy with the result. I am dying for colder weather so I can wear this baby out. It's 100% wool with 6 vintage buttons (and one new metal button). This next sweater I actually finished ages ago but never got around to photographing. 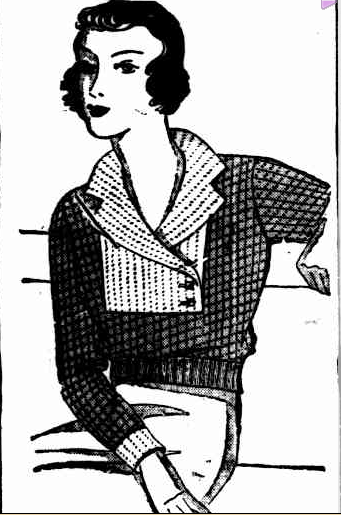 It's from a free 1950's "evening sweater" pattern. It was suppose to have an off-the-shoulder knitted piece but after trying it I decided to remove it and add a piece of taffeta ribbon. I have yet to find an excuse to wear this top. Maybe a Christmas party later this year? And finally a knitting flop. I designed this 1920's style dress a couple years ago but it took me ages to actually get it sewn up. It was originally going to have ruffles but I never finished them. I'll admit it looks cute on the hanger but it looks extremely terrible on. I may wear it was a warm slip in the winter, or just frog the entire thing and resuse the yarn. PS: If anyone else is on Ravelry you can find me here. Please feel free to add me as a friend. I love looking at what other people have knitted and discovering new patterns through friend's favourites list. Lovely work. I can't wait to see the 1930's sweater. Congratulations for finishing some of your projects. Like you I love starting projects but I often do not finish them. Maybe your post could be an incentive to finish at least some of them. But you know when you start something there's a thrill of anticipation but if you don't finish it fast enough that feeling will be over and you have to conquer your weaker self to go on. So be proud of yourself to have come to an end with these projects and I hope you will wear them often. I think you will wear the sweater very often in autumn cause it looks really nice with trousers and skirts. It has just the right length to be worn with vintage skirts. Wish you a wonderful Sunday with many magical moments! That cable knit is really beautiful. Well done for finishing so many big knits! My goodness, you've been a busy lady indeed! Lovely, timelessly pretty creations one and all (I'm sorry that the 20s style dress didn't work out for you in the end). I especially love the teal hue of the first sweater. Partnering that colour with chocolate brown is (and sometimes cream, too) is one of my all-time fave colour pairings.